Transparency Market Research (TMR) in its latest report reveals that the global chemical protective gloves market is set to exhibit a CAGR of 4.6% from 2017 to 2026 and reach a valuation of US$ 3,641.8 Mn. Increasing efforts to improve worker safety in manufacturing facilities and factories is likely to influence the global chemical protective gloves market during the forecast period (2017-2026). Demand for chemical protective gloves has been witnessing an uptrend due to introduction of worker safety policies in emerging. Therefore, manufacturing facilities in these countries are now bound to increasing their worker safety standards or else risk being charged for regulatory violation. Chemical protective gloves find a ton of application, they are used in industries such as manufacturing, construction, pharmaceutical, agriculture and oil & gas among other. Such gloves are extremely important in high-risk working environment, chemical protective gloves can significantly reduce the impact of exposure of hand to harmful chemicals. Also, worker injuries and illness is a major concern for both private sector and public sector. The U.S department of labour stated that there were 1,153,490 days-away-from-work cases in private industry, state government, and local government in 2015. Hand injuries or illnesses is one of the major reasons for days-away-from-work. In order to curb such time-loss and injury frequency rate, manufacturing facilities are upgrading their worker safety model. Moreover, government is developing countries are stepping up efforts to spread awareness about worker safety. The worker safety regulation are moderate in third world countries, hence, worker are at a higher risk of picking up injuries. The increased level of awareness among people towards health and safety at work in both developed and developing countries is also expected to drive the global sales of chemical protective gloves in the years to follow. Demand for chemical protective gloves is expected to remain high in North America in 2018 and beyond. In terms of revenue, the region is expected to dominate the global chemical protective gloves market throughout the assessment period. The market in the region is expected to witness a steady CAGR of 4% between 2017 and 2026. This is primarily owing to presence of a well-defined worker safety regulatory landscape, which ensures adherence to safety standards of the highest level. Preference for nitrile gloves will continue to remain strong during the foreseeable period. This is primarily due to their superior resistance as compared to other type of clubs. Nitrile gloves have greater resistance to acids, oils and chemicals. Currently, global sales of nitrile gloves represent for more than 45% revenue share of the global chemical protective gloves market. By 2026-end, around US$ 1,879.9 Mn worth nitrile gloves are expected to be sold worldwide. Use of chemical protective gloves is expected to remain significantly high in the manufacturing sector. Workers are exposed to various types of risks in manufacturing plants, hence, self-protection gears such as protective gloves are crucial. In 2017, over US$ 500 Mn worth chemical protective gloves were sold in the manufacturing industry. Leading players operating in the global chemical protective gloves market include 3M Co, E I Du Pont De Nemours and Co., Honeywell International Inc., Ansell Limited, Avon Rubber Plc., Msa Safety Inc., Uvex Safety Group, Grainger, Inc, Bullard, Kimberly-Clark. Transparency Market Research examines the global chemical protection gloves for the forecast period 2017-2026. The main objective of this research report is to recognize the opportunities in various regional markets and deliver updates as well as information regarding the various aspects of global market for chemical protection. The report commences with an overview of the global chemical protective gloves market, with assessments on key market segments offered in the report in terms of revenues. The report also includes an executive summary that highlights the key market segments where player may find extensive opportunities. This section of the report is followed by an in-depth analysis of key drivers, opportunities, trends and restraints that are likely to influence the market in the near future. Impact analysis of the key drivers and restraints based on the weighted average model is also included in the report. The report also offers an all-inclusive perspective on the growth of the global market for chemical protective gloves in terms of revenue estimates (in US$ Mn). The fact and figures presented in the report are based on the assessment made after considering the impact of various political, economic, technological, legal and technological aspects along with existing dynamics influencing the market on a global level. Further, the report offers industry development and key market indicators for the global chemical protective gloves market. The report also offers a thorough analysis on the competitive landscape of the market, market dynamics and the most profitable segments in the market. This report on the global market for chemical protective gloves offer a detailed cross segment and cross country analysis based on the different segments including product type and applications. Based on the product type, the market is segmented into butyl gloves, natural gloves, neoprene gloves and nitrile gloves. By application, the chemical protective gloves market has been segmented into manufacturing, construction, oil and gas, transportation, pharmaceuticals, chemicals, food, mining, agriculture and defense & maritime. 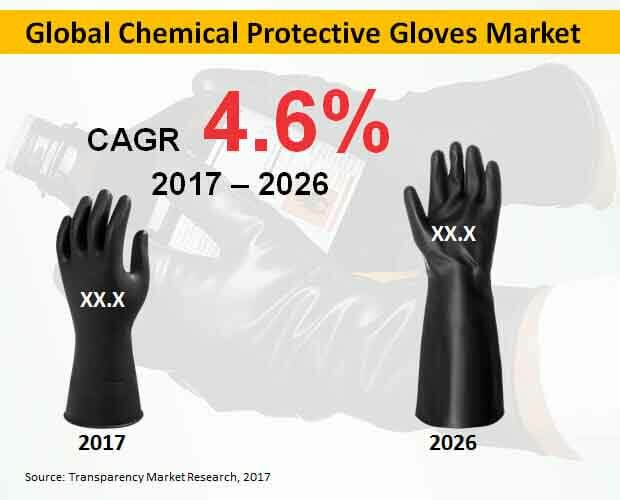 The report also offers a profiling of leading market players, their growth strategies and recent developments under the competition landscape section, which includes market positioning analysis of prominent companies functioning in the chemical protective gloves market. The competition landscape offered in the report for global chemical protective gloves market notes capabilities and growth potential of companies and also benchmarks the key companies in the global market on the basis of top line growth, segment growth, market position, R&D focus, market share, infrastructure capabilities, product offerings, and future outlook. TMR has used a novel and credible research methodology for obtaining revenue estimated related to the global chemical protective gloves market. In addition, a through in-depth secondary research has been conducted for estimating overall market size and identifying top market players. Also, the data in the report has been sourced from valuable inputs from company executive and industry expert through exhaustive primary interviews. Such research methodologies allowed an unbiased rendering process of market analysis and forecast. Information collected through secondary and primary research are authenticated carefully and verified using the advanced tools for making definitive conclusion on the global chemical protective gloves market.